No drilling, no chips, no problems with parts that are unfavorably positioned or otherwise difficult to reach – WITTENSTEIN alpha’s new, assembly-friendly principle makes pinning racks far easier. The two- piece mounting kit comprised of a special pin and sleeve, which are fitted together using just an Allen key and a hammer, enables racks to be fixed to the machine bed with a positive connection. Securely pin a rack with two pin holes in as little as one minute. The rack can also be replaced quickly and easily for servicing. The foundation for pinning was laid back in 1918 with the publication of DIN 1, the very first German standard. Then, as now, this positive connection principle improved the positioning accuracy of machine components and protected them against overload. The latter is particularly crucial in applications involving racks. It stops the rack from slipping due to high loads, for instance in the event of a crash or other emergency situation. This could result in an alignment or pitch error at the interface between two racks, leading ultimately to the failure of the complete rack-and-pinion drive system. In heavily loaded axes, therefore, pinning the rack is vital in order to rule out the risk of failure or threats to availability. Chips and swarf are always undesirable during assembly work: they are difficult to control and have a destructive effect. WITTENSTEIN alpha’s new chipless pinning principle successfully amends a proven method that was first established in the market several decades ago; it was developed in response to customer demands for quick and easy assembly. Chipless pinning offers numerous advantages for machine builders: instead of drilling and reaming the rack and the machine bed together in a time consuming process and then driving in the pin, this innovative, two-piece assembly solution from WITTENSTEIN alpha facilitates a secure and completely chipless connection! The holes which are required in the bed can be machined to fit exactly when the components are manufactured – in a single setting with the fixing holes. The two-piece mounting kit is comprised of a special pin and sleeve, which are fitted together using just a hammer and an Allen key. 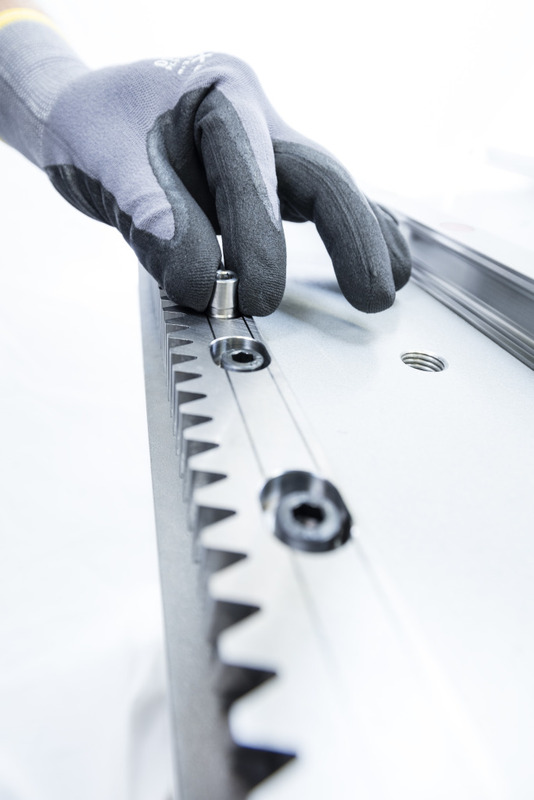 The time saving as a result of this chipless assembly process is quite substantial: each rack can be securely fixed with a positive connection in less than 60 seconds – compared to 35 or 40 minutes with conventional pinning. Easy dismantling and reusability mean the rack can be exchanged rapidly in case of repairs or retrofits. The new INIRA rack pinning principle exemplifies how WITTENSTEIN alpha defines “efficiency engineering”. The focus is not confined to innovative, high performance products; optimized machine concepts, control technology, software, tools and processes are equally in the spotlight. “Efficiency engineering” combines all effectiveness and efficiency aspects of WITTENSTEIN alpha products, systems and solutions, which are based on efficient engineering services and efficient production processes. Located in Bartlett, Illinois, WITTENSTEIN North America produces components that deliver the utmost precision and system performance. From low-backlash planetary gearheads to complete mechatronic drive systems, our products set benchmarks worldwide in machine building and drive technology. With around 1900 employees worldwide and sales of approximately €300* million in 2015/16 (*provisional figure), WITTENSTEIN AG enjoys an impeccable reputation for innovation, precision and excellence in the field of mechatronic drive technology – not just in Germany but internationally. The group comprises eight pacesetting Business Units with separate subsidiaries for servo gearheads, servo actuator systems, medical technology, miniature servo units, innovative gearing technology, rotary and linear actuator systems, nano technology and electronic and software components for drive technologies. Through its 60 or so subsidiaries and agents in approximately 40 countries, WITTENSTEIN (www.wittenstein.de) is additionally represented in all the world's major technology and sales markets. See video demonstation at https://vimeo.com/206233676.